Official group photo from the 2017 WingTsun Seminar With Great Grandmaster Leung Ting – Click on the photo to see it larger. Students and instructors from all around the North American Section of the International WingTsun Association (IWTA-NAS) gathered in San Antonio, Texas, on October 20-22, 2017 to train 4 hours per day directly with Great Grandmaster Leung Ting, the Golden Rank Founder of Leung Ting WingTsun®! Hosted by Master Will Parker of the San Antonio WingTsun Academy, the Friday sessions of the seminar were reserved for instructors and senior students (10th Student Grade and up). Seminar sessions on Saturday and Sunday were open to all current IWTA-NAS members of all Grades and Levels. 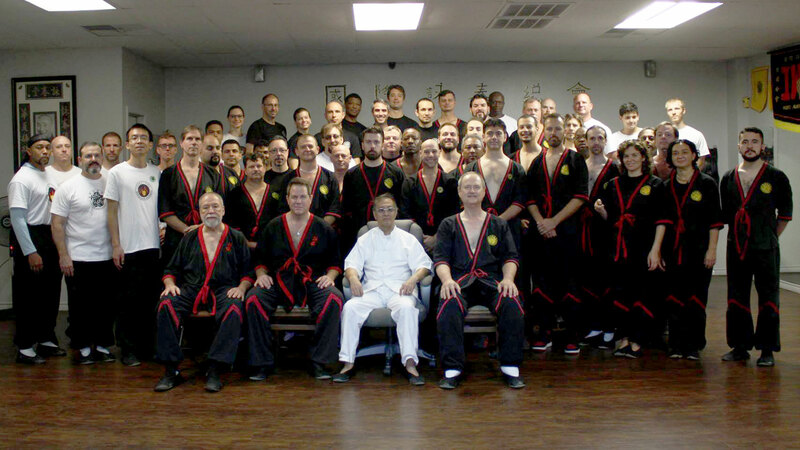 Students and instructors worked on refinements and in-depth details on their forms, chi-sau, and fighting applications. And everyone had the opportunity to have their questions about WingTsun answered directly by GGM Leung Ting! A fun and exciting time was had by all as they learned and refined their WingTsun skills!